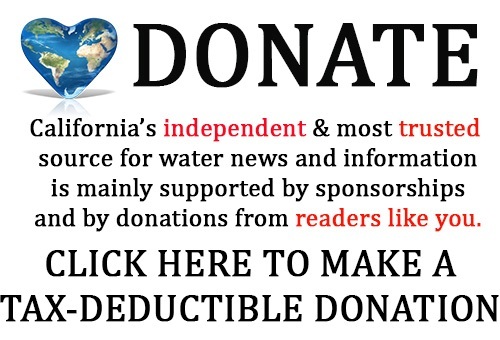 In November 2014, California voters approved Proposition 1, the Water Quality, Supply, and Infrastructure Improvement Act of 2014. 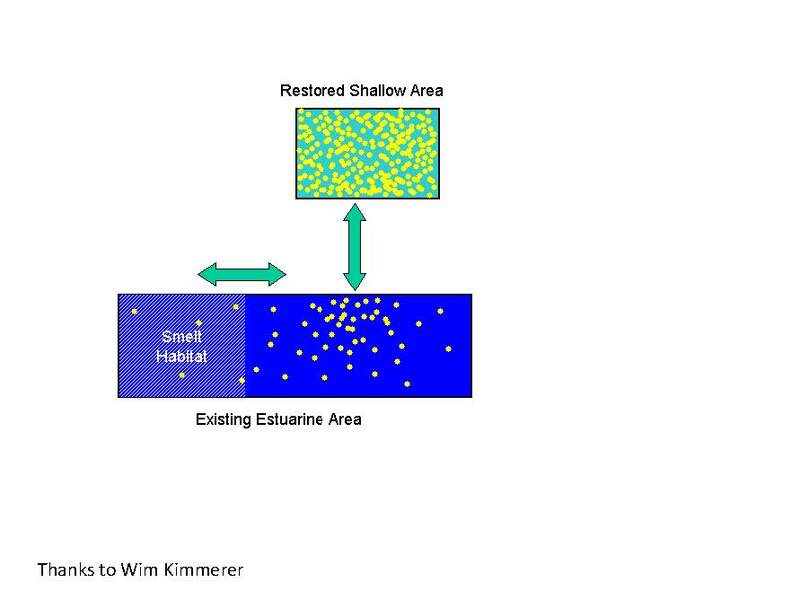 Chapter 8 of Proposition 1 provides $2.7 billion for public benefits associated with water storage projects that improve the operation of the state water system, are cost effective, and provide a net improvement in ecosystem and water quality conditions. 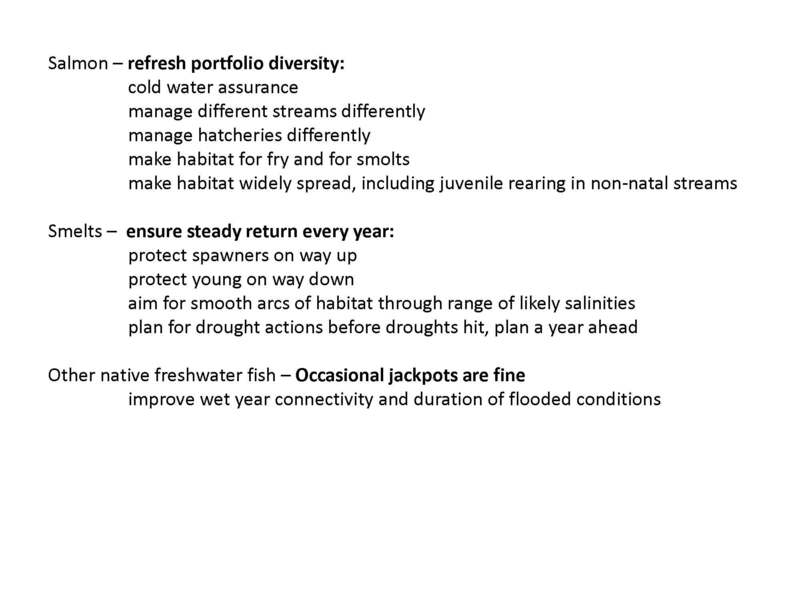 Eligible projects must also provide measurable benefits to the Delta ecosystem or its tributaries. With the application period for the Water Storage Investment Program closed, Commission staff are working through the applications. 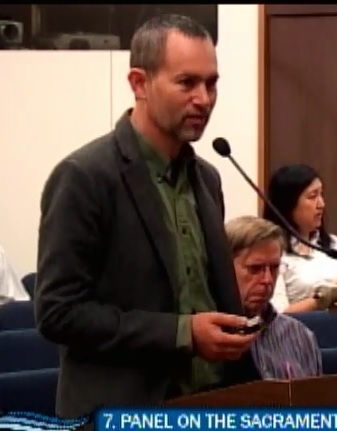 In order to inform Commission members who will ultimately make the decision, a panel was assembled at the August meeting of the Commission, held at the Bay Model in Sausalito. The panel was comprised of Jessica Pearson, Executive Officer of the Delta Stewardship Council; Robin Grossinger, Senior Scientist with the San Francisco Estuary Institute; Dr. Bruce Herbold, retired fish biolgoist with the EPA; and Hap Dunning, professor of law at UC Davis; they discussed the ecological history, the restoration challenges, and the legal framework overlaying the Delta. 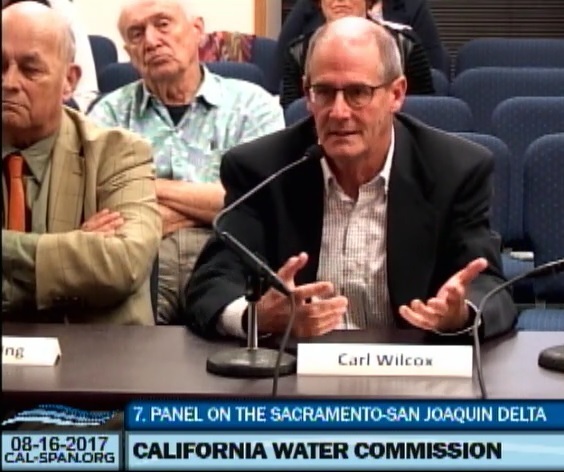 After the panel presentation, Carl Wilcox, Delta Policy Advisor with the California Department of Fish and Wildlife and Jennifer LaBay, Environmental Scientist, State Water Resources Control Board joined the discussion. Ms. Ruffolo then introduced Jessica Pearson, the executive officer of the Delta Stewardship Council, who then gave an overview of the role of the Delta Stewardship Council and how the Council is focusing on science and policy in the delta. The Delta Plan, adopted in 2013, includes 73 recommendations and 14 regulations. “The Council mainly does its job through inter-agency collaboration, but was given a novel regulatory authority by the legislature, known as covered action authority,” she said. 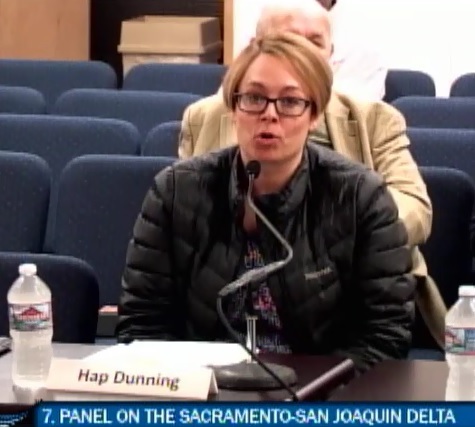 She explained that a covered action must meet a five-part test: It’s a plan, a program or a project under CEQA; it occurs in whole or in part in the Delta; it’s an action carried out, approved or funded by the State; it’s covered by one or more provisions in our Delta Plan; and will it have a significant impact on the achievement of the co-equal goals, and/or a government-sponsored flood control program. 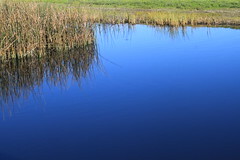 Projects must certify consistency with the Delta Plan’s 14 regulations; that certification is subject to appeal and review by the Delta Stewardship Council. 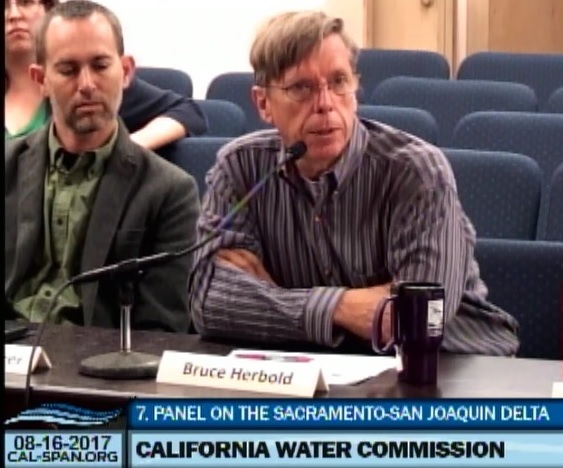 The Delta Stewardship Council has seven members and a staff of about 60. 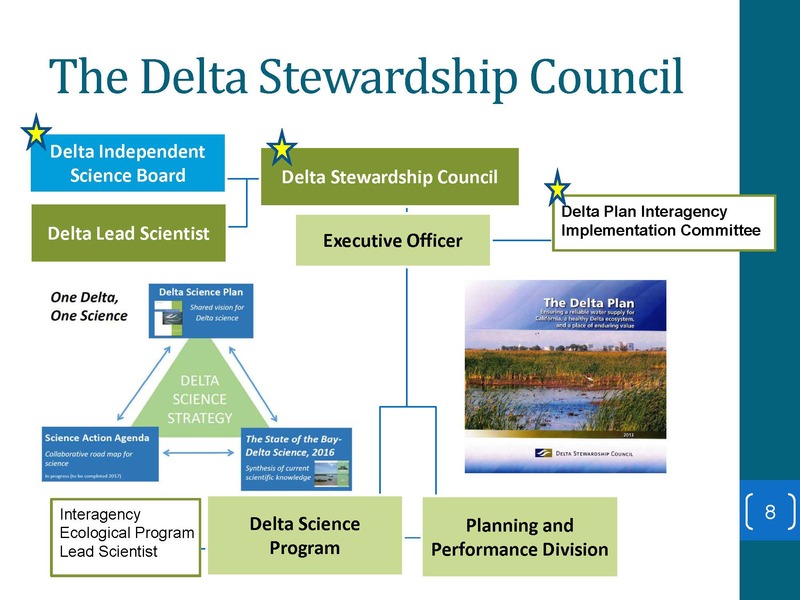 The Council also includes the Delta Science Program, which is guided by a vision of ‘One Delta, One Science,’; their job is to synthesize and communicate best available science to decision-makers, as well as to coordinate and improve how Delta science is done. They conduct independent reviews, organize brown bags and symposia on key issues. About $5 million per year is funded for research. The Council is also informed by a 10-member independent Delta Science Board. The Council has a full-time chairman, Randy Fiorini, and six part-time members. One of the members is the chair of the Delta Protection Commission, a rotating position which is typically a Delta County Supervisor. There is one Senate appointee, one Speaker’s appointee, and four gubernatorial appointees. There is a Delta Lead Scientist, employed by the USGS, a position intended to guide the Council on science as well as serve as a mentor for Science Program staff. The Lead Scientist is recruited by the Independent Science Board and appointed by the Delta Stewardship Council. Ms. Pearson noted that the Council doesn’t implement the Delta Plan by itself but relies on other agencies and project proponents. The legislature envisioned this and directed the Council to establish a committee of agencies responsible for implementing the Delta Plan. 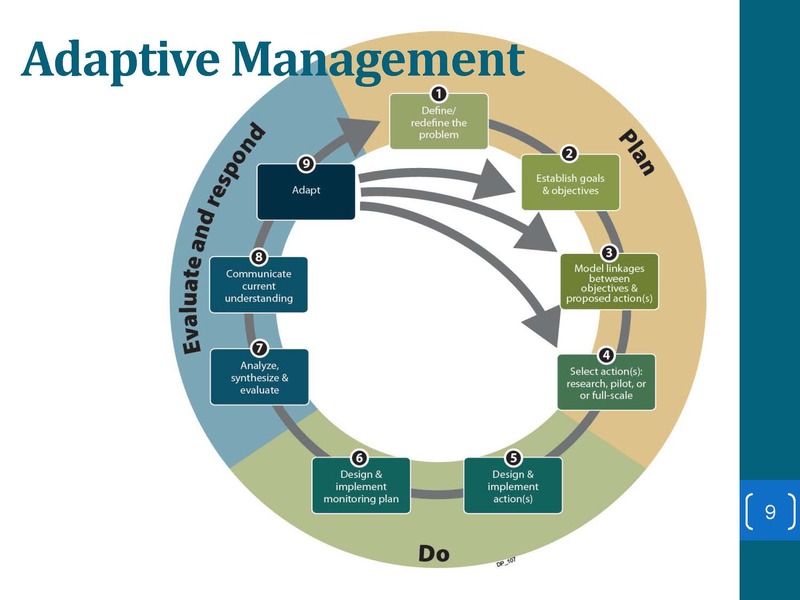 The Delta Plan Interagency Implementation Committee consists of 17 state and federal agencies which meets twice a year, as well as year-round work groups to move initiatives forward. The Delta Plan and its 73 recommendations and 14 regulations calls for a comprehensive approach. Delta Levee Investment Strategy which sets priorities for state investment in Delta levees to reduce the likelihood and consequences of failure in order to protect people, property, and state interests, which includes the co-equal goals. 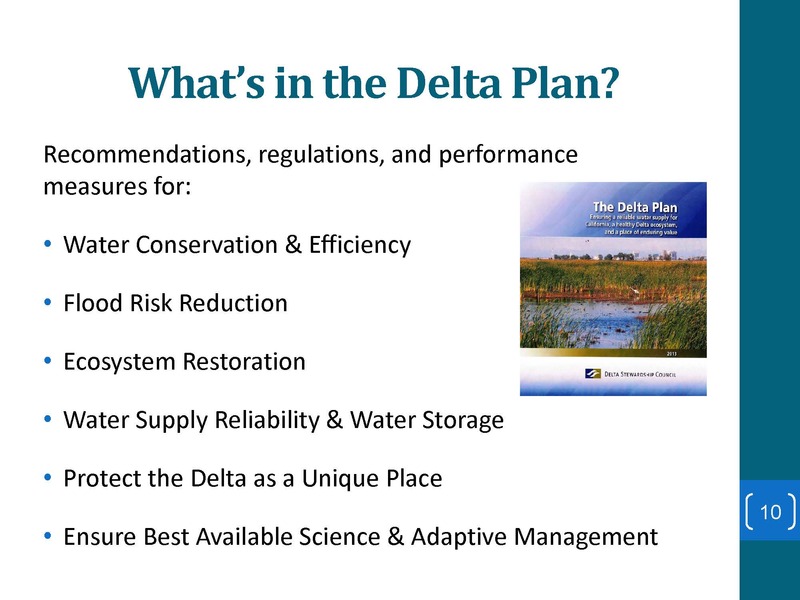 The Delta Plan Performance Measures, a requirement of the Delta Reform Act, are intended to quantitatively measure progress and gauge the effectiveness of the Delta Plan. The Conveyance, Storage, and Operations Amendment, which the Council began working on in the summer of 2015, when the Bay Delta Conservation Plan changed course, splitting into Water Fix and Eco-Restore. This triggered a commitment in the Delta plan to revisit the directive in the Delta Reform Act that the Council promote options for conveyance, storage, and the operations of both to achieve the co-equal goals. Robin is a senior scientist at the San Francisco Estuary Institute where he is one of the directors of the Resilient Landscapes Program. Over the past few years, Robin and his team have produced the Delta Landscapes Trilogy of reports that analyzes and recommends strategies for improving the Delta ecosystem. Robin Grossinger began by saying his job was to discuss the Delta in terms of how the ecosystem worked, how it’s changed, and what the broad ideas are for its restoration and improvement. 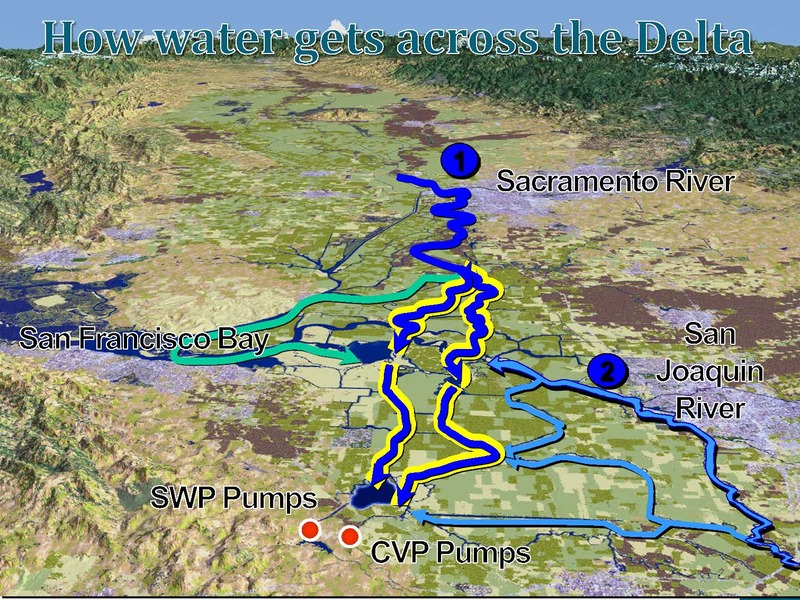 He noted that this presentation is drawing on a series of reports the San Francisco Estuary Institute (SFEI) has done over the past five to six years that analyzed how the Delta used to work, how its changed, and what’s possible in the future. SFEI is a not for profit, independent, impartial science entity created by agencies and NGOs to provide this kind of guidance for decision-making; SFEI also administers a Joint Powers Authority of the state called the Aquatic Science Center; and they work closely with DFW, the Delta Science Program, the Delta Stewardship Council, and others to provide some of the science information and underlying policy decisions. Mr. Grossinger then presented two slides to demonstrate the tremendous transformation system: the Sacramento River before extensive modification in the 1850s, and what it looks like today. In the Central Delta, there were masses of tidal channels that branched into smaller and smaller networks – thousands of miles of channels, he said. There are little pieces are left; on some agricultural islands, it was inefficient to continue the levees around the narrow tips of islands, so those were left as marshes, and the islands that are in the middle of the channels now were originally connected to those larger patches, he said. In 1861-62, there were massive floods, which is more than just an interesting historical factoid because scientists now understand that the phenomenon that created that flood remains and is likely to occur again. “That event is used as some of the basis for testing out what can happen in the future, so it’s not irrelevant,” Mr. Grossinger said. Mr. Grossinger presented a map used to help guide miners headed to the Gold Rush around 1850. There are photographs of the marsh once cameras became available, and quotes from early explorers describing the vast plain. 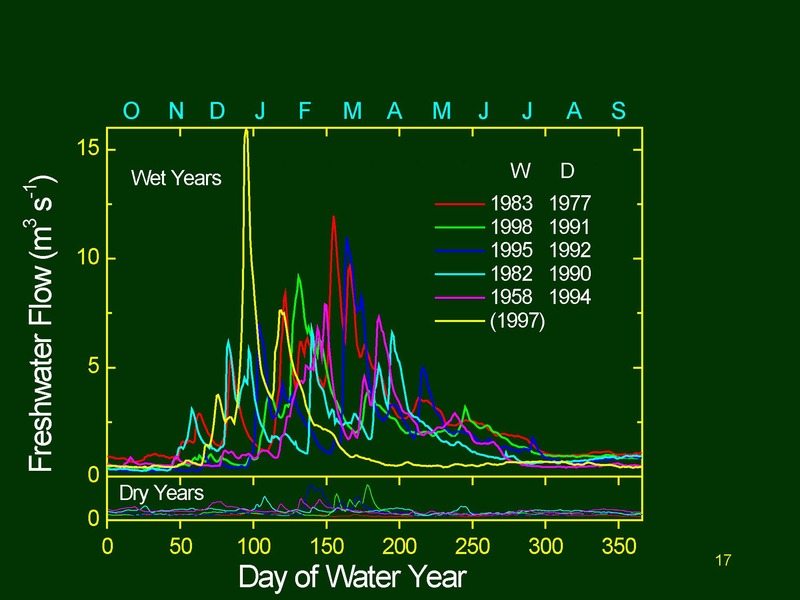 He presented a chart showing flooding between 1850 and 1860, pointing out that flooding would last well into May or June almost every other year or so. So they took all that historical information and put that together into a picture of how the system used to work into the report, Sacramento-San Joaquin Delta Historical Ecology Investigation: Exploring Pattern and Process. The second report, A Delta Transformed, took a look at how the human development has changed the Delta’s ecosystem. The third report, A Delta Renewed, looks at strategies for restoration of the Delta in the future. 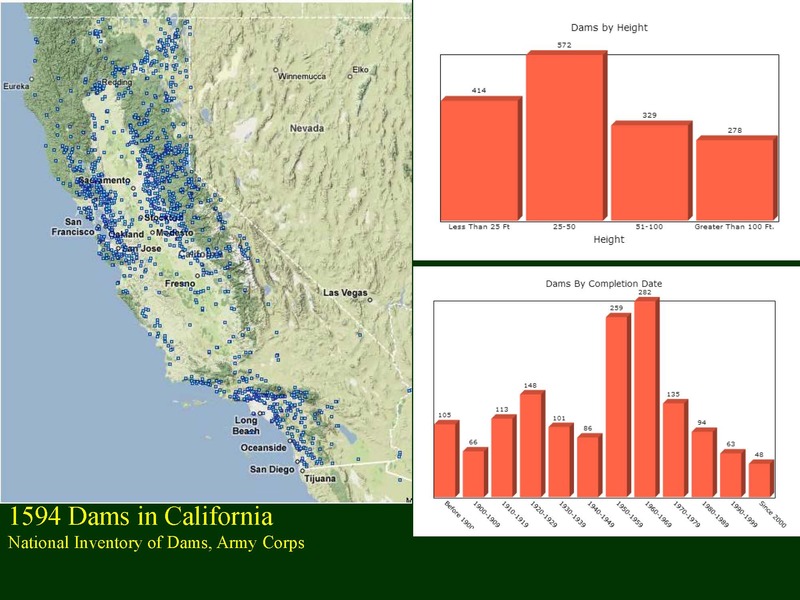 These reports were done in conjunction with the Department of Fish and Wildlife, and many of the scientists working with the Delta Science Program. 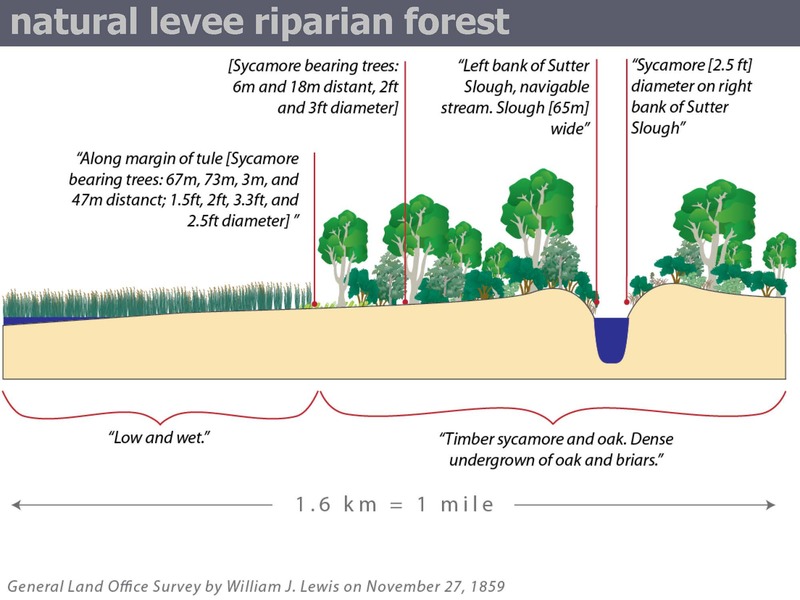 Click here to access all three reports for the Delta Landscapes project. “Those provide a new basis for managing the Delta as an integrated system, and supporting the processes that enable a functional ecosystem,” Mr. Grossinger said. 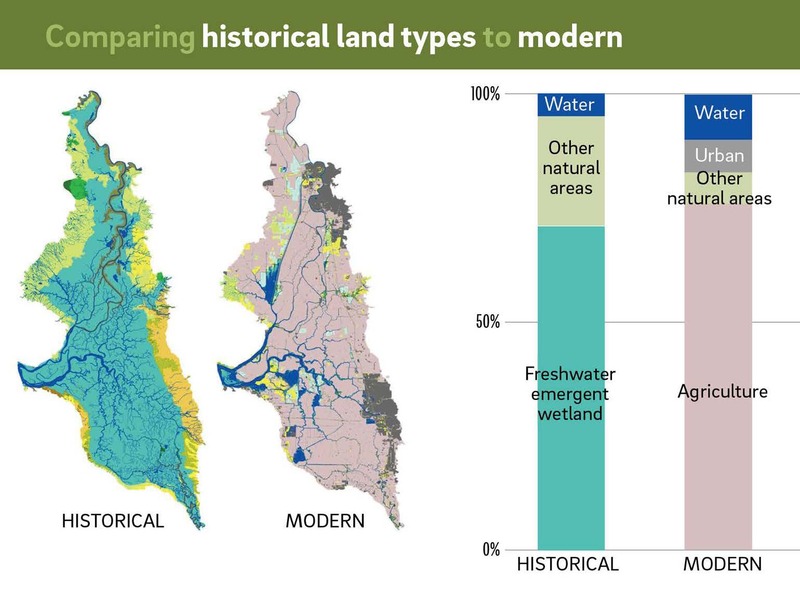 He presented a graphic showing how much the Delta’s landscape has changed since human development. 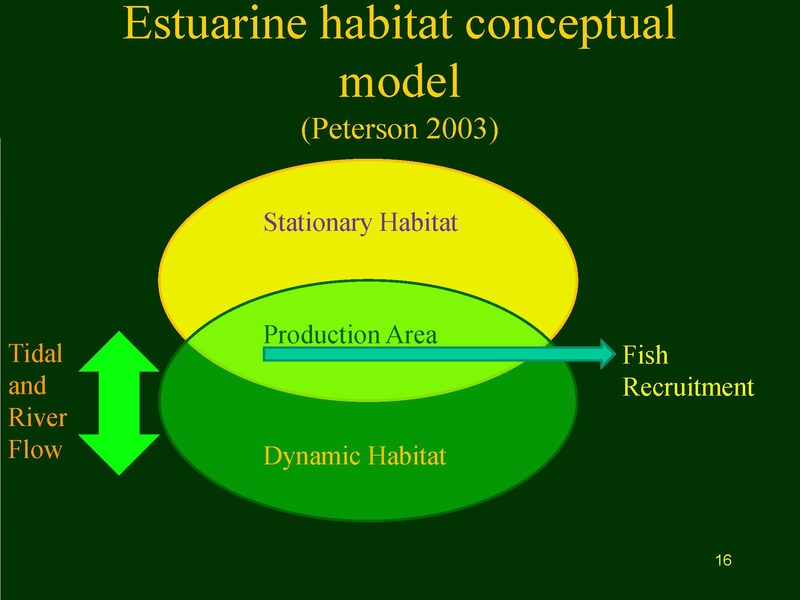 He noted that tidal wetlands dominated the system historically and it was a very productive ecosystem; now agricultural lands dominate the system, while also a very productive ecosystem, it’s quite different. A lot of other habitats existed around the periphery, such as oak woodlands, seasonal wetlands, and different types of wetland like the riparian forest along the creeks; there was a lot of complexity that was probably important to that ecosystem as well, he said. 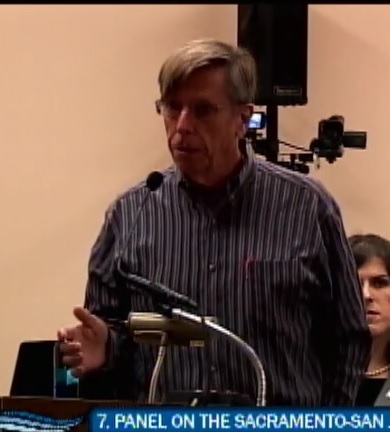 Mr. Grossinger then discussed flooding, noting that this might be something the Water Commission might be able to influence through the decisions they make. Historically, it was a very complex system, but through their research, they identified several types of flooding. The light blue areas were flooded tidally, particularly during the higher tides. A massive area of several hundred thousand acres would be flooded rather frequently; fish were able to get out onto the marsh and food came back into the channels from the marsh. 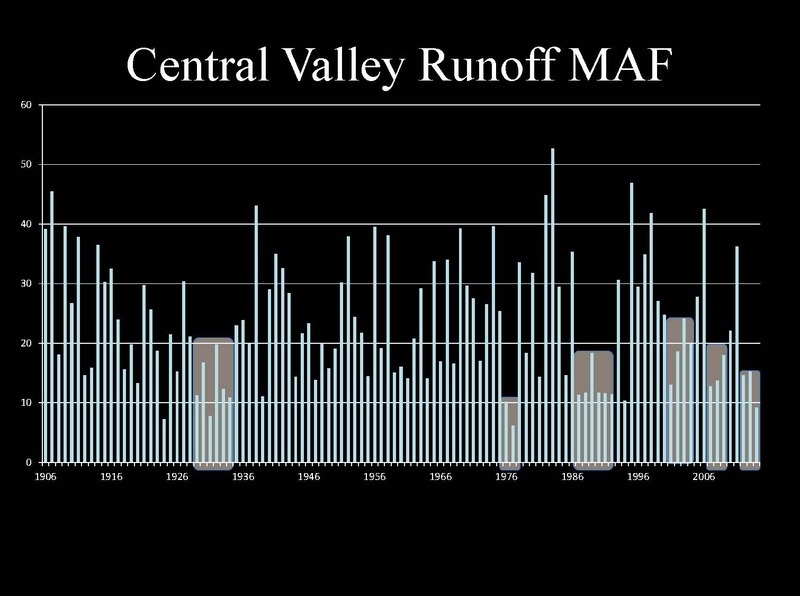 The darker blue areas were flooded in late winter and spring; they called this seasonal long duration flooding. Those areas could flood for weeks or months at a time. “Our native fish species were evolved to take advantage of that huge pulse and expansion of habitat, the ability to fatten up as they head out to the ocean,” he said. The very light blue represented flooding for days or weeks, which fish still were able to take advantage of because the fish had evolved to take advantage of the complex California climate, he said. In the third report, they emphasize establishing the processes that support the ecosystem, not just restoring little pieces here and there, he said. 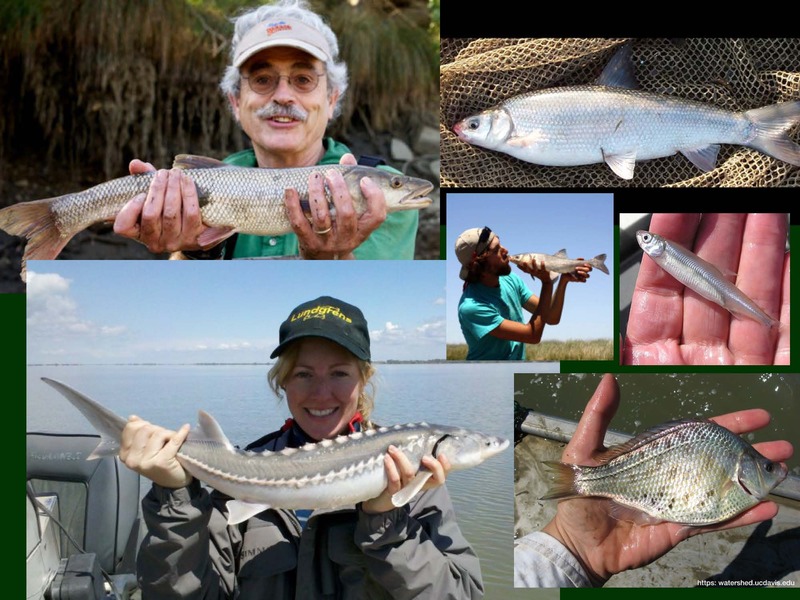 Dr. Bruce Herbold has studied the ecology of California’s estuarine fishes since 1979. He received his PhD under Dr. Peter Moyle at UC Davis; he worked for 21 years with the US EPA on management issues of fish and water. Since retiring from the EPA in 2013, he works as a private consultant on the same issues. Delving into it further, consider just two of those adults coming back to spawn, he explained. They spawn; they produce a bunch of eggs. Those eggs have to be spawned in the correct places, and then once those young come out, they’re subject to a variety of new stressors along the way, he said. 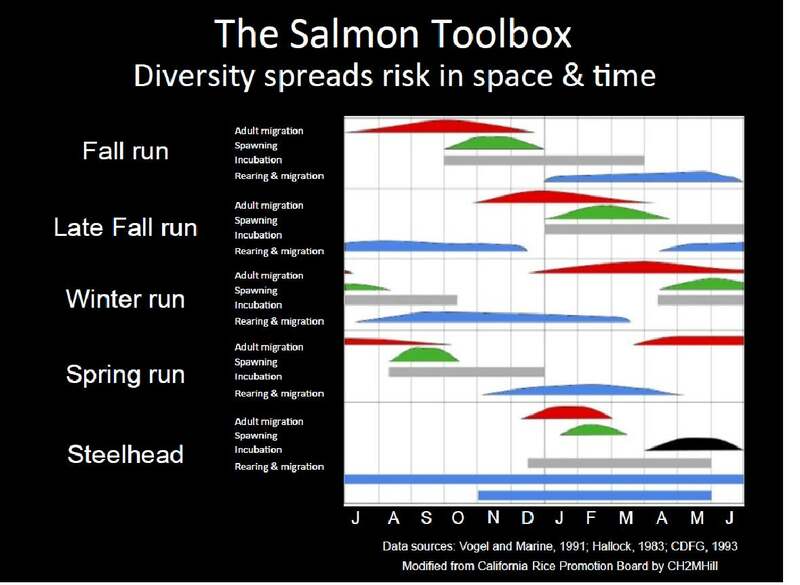 A lot of our salmon relied on reliable cold water sources, spawning on the streams coming off of Mount Lassen or coming off of Shasta; no matter how dry it was in California, there was always cold water that was always suitable for spawning, he said. “In ideal conditions, those two adults produce enough young so that two adults can come back in three or four years and produce all those young again,” he said. 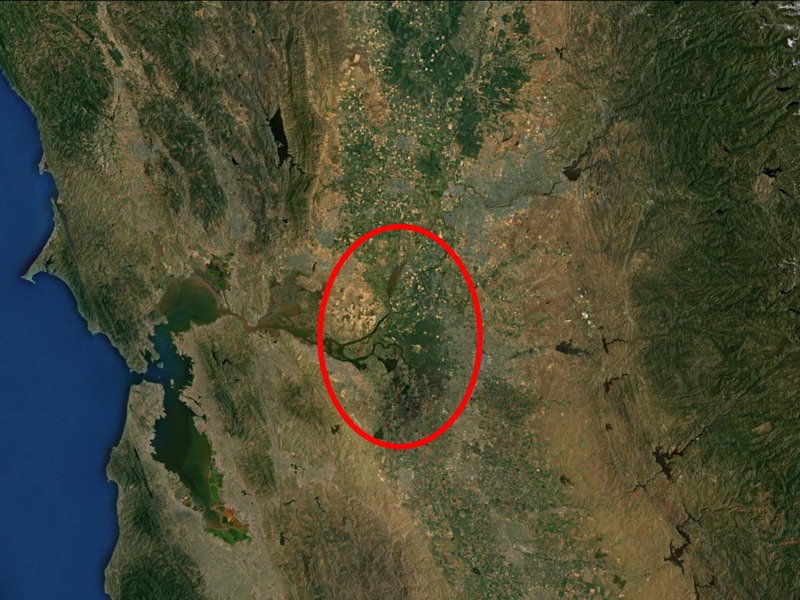 One of the differences comparing the Sacramento Valley versus the Central Valley is that in the San Joaquin there are canals that move water around, so the water is taken before it reaches the Central Valley, whereas in the Sacramento Valley, they use the same river channels to move the water downstream. 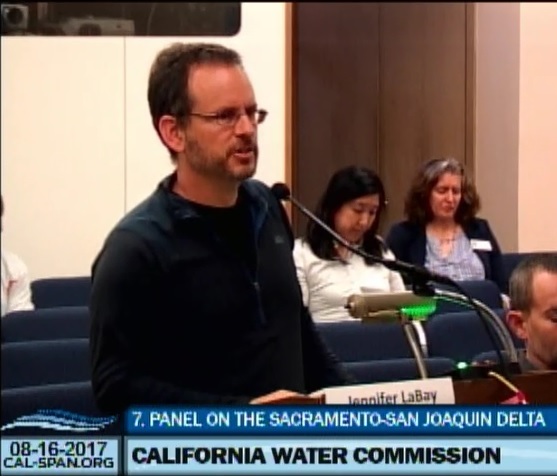 “In the Sacramento Valley, they still look sort of like rivers, whereas San Joaquin has very little water in that a lot of the year, most of that water being agricultural return flows that are salty and nasty,” Dr. Herbold said. Dr. Herbold said that the historical ecology study has been ‘surprisingly valuable.’ “Because the footprint is still there and the processes that produce that footprint are still there, so if we’re going to try to restore things, it’s nice to know how they used to work,” he said. Jennifer Ruffolo then introduced the third panelist, Hap Dunning, a professor of law emeritus at UC Davis School of Law. He is a leading expert in natural resources law and water law, and he is the author of the public rights portion of a leading national treatise on water law called “Waters and Water Rights”; he has written numerous articles on water law particularly with regard to the public trust doctrine. 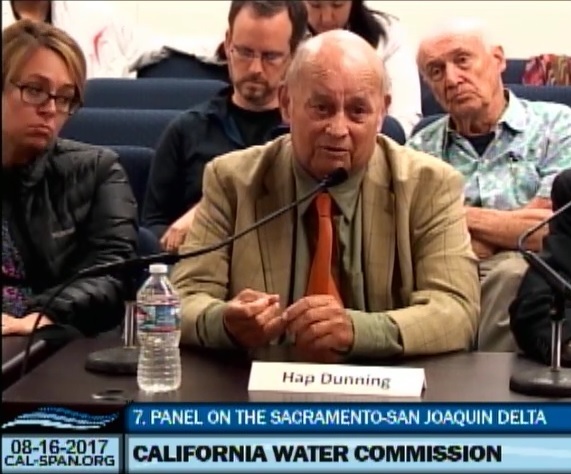 In 1977-78, Hap Dunning was the staff director of the Governor’s commission to review California water rights law and he served on the Water Commission during the second term of Governor Jerry Brown’s first administration. 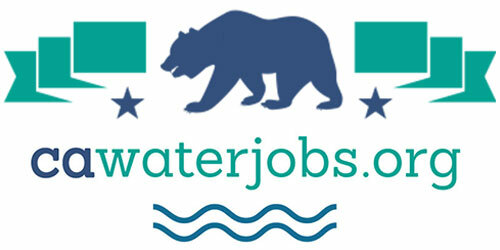 The other water rights were developed starting in the 1850’s with statehood. 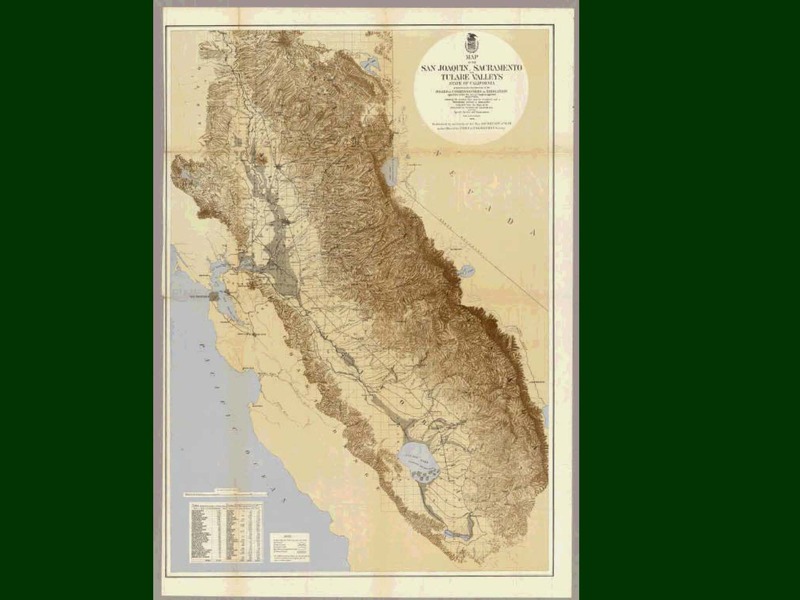 Mr. Dunning noted that a chief justice of the California Supreme Court in the early 1900’s claimed that they had more water rights cases in the California Supreme Court than any other kind of case. “This was really central; it was politically important and legally important,” he said. Mr. Dunning said he would use the issue of salinity intrusion to discuss legal aspects because salinity is central issue: As the Delta was developed for agriculture, as well as municipal and industrial water supply, it’s important that the water not be too salty, else it was not usable and couldn’t be put to beneficial use. There was time in the early 1920’s when there was an attempt to utilize the water rights system to deal with the salinity problem. Mr. Dunning noted that a couple significant things happened between 1917 and 1920: There was a lot of federal dredging in the part of the system between Rio Vista and Collinsville; and a lot of land in the Sacramento Valley was going into rice production, which involved diversion of water, flooding the rice fields, and then putting it back in the river later on. So then what to do about the salinity problem in the Delta? The attention in the 1920s turned to having some kind of physical solution – some kind of barrier. 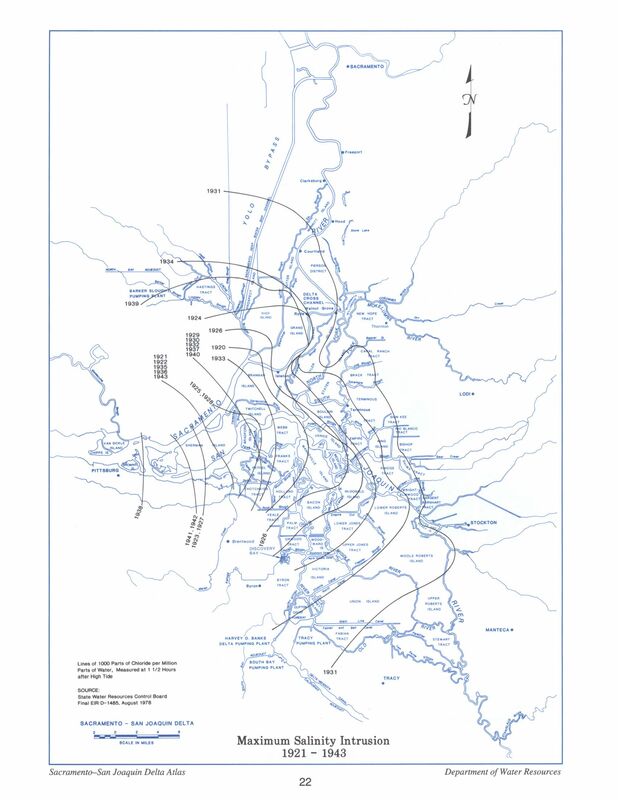 The idea that was studied and discussed a great deal in the 1920s was to have a salt water barrier – a dam in Carquinez Strait and the question was where in the strait should it go? 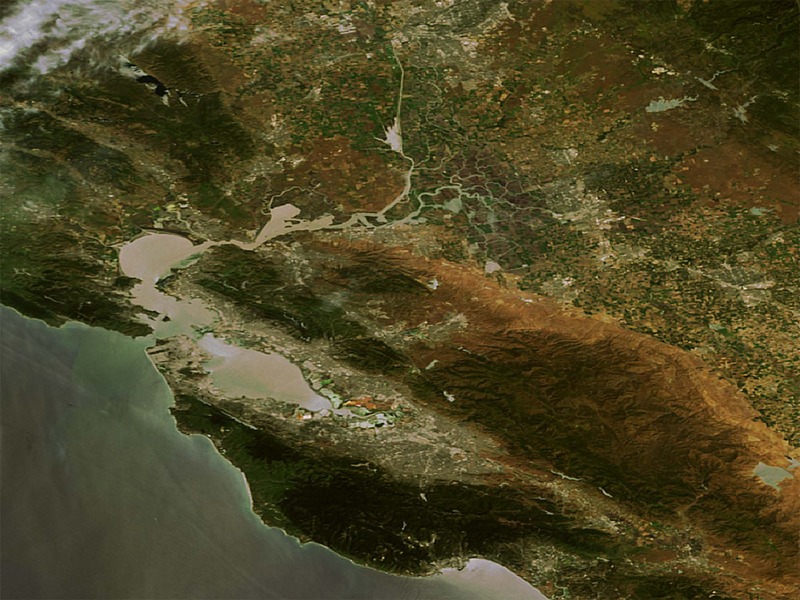 The strait is seven to eight miles long, and connects the Suisun Bay on the upstream side and San Pablo Bay on the downstream side. A similar idea was floated in the 1940s known as the San Francisco Bay Project or the Reber Plan, after the actor who popularized the plan. 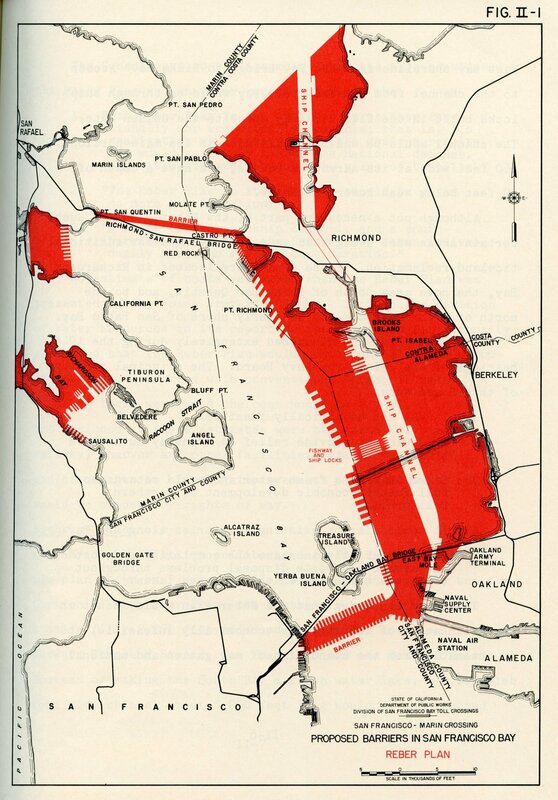 The plan, which was discussed a lot at the time, was to build a new causeway between Oakland and San Francisco and fill in a large part of San Francisco Bay. The Bay Model was built in the 1950s to have a physical model to study the consequences of doing that, Mr. Dunning said. At the time, many dams had been constructed; Shasta went into operation in 1943 and there other dams as well. “We had a state water rights board that developed this idea that even stored water would have to be available in order to control salinity for the benefit of agriculture and for the benefit of urban use. 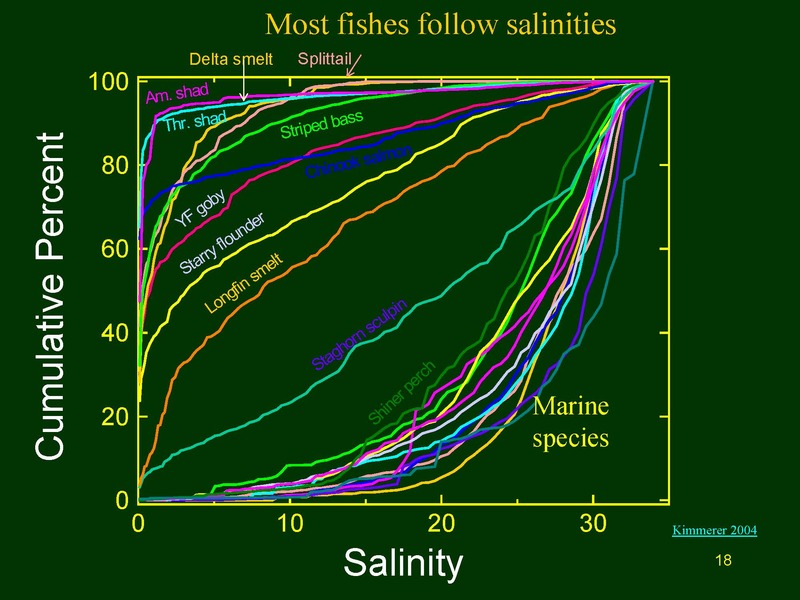 In the early days, when you look at those reports, there wasn’t much discussion about fish, but salinity’s important for fish, too,” he said. Initially, after the two functions were formally combined in the State Water Resources Control Board, the practice was to prepare the Water Quality Plan and a Plan of Implementation, which affected the Water Rights at the same time. “It made a certain amount of sense because what level of water quality you can achieve really does depend on how well you can condition water rights, if you’re going to do it with this hydraulic barrier approach,” he said. 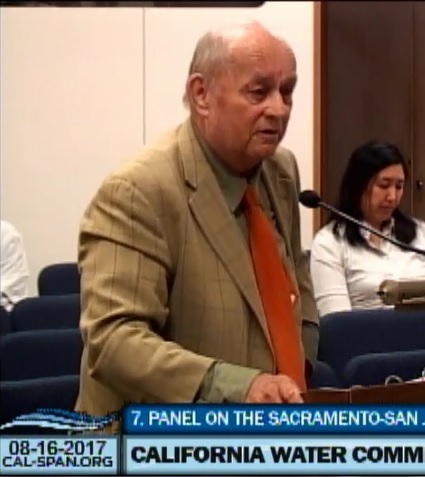 Mr. Dunning noted that decades later, the State Water Resources Control Board is updating the Bay Delta Water Quality Control Plan, and they are looking at contributions that might be required of diverters on the Tuolumne River, the Stanislaus River, the Merced River, and others. So far, he has been talking about state laws, but federal law is also very important. In 1972, the Clean Water Quality Act was enacted. The Environmental Protection Agency had just been created, and President Nixon had said that the 1970s would be the decade of the environment. “The Clean Water Act imposed various requirements on the state so that when the State Water Resources and Control Board goes about its business of doing water quality control plans and plans of implementation and conditioning water rights, it’s really subject to federal review and oversight and in a couple of cases, federal disapproval of what the state has done,” he said. 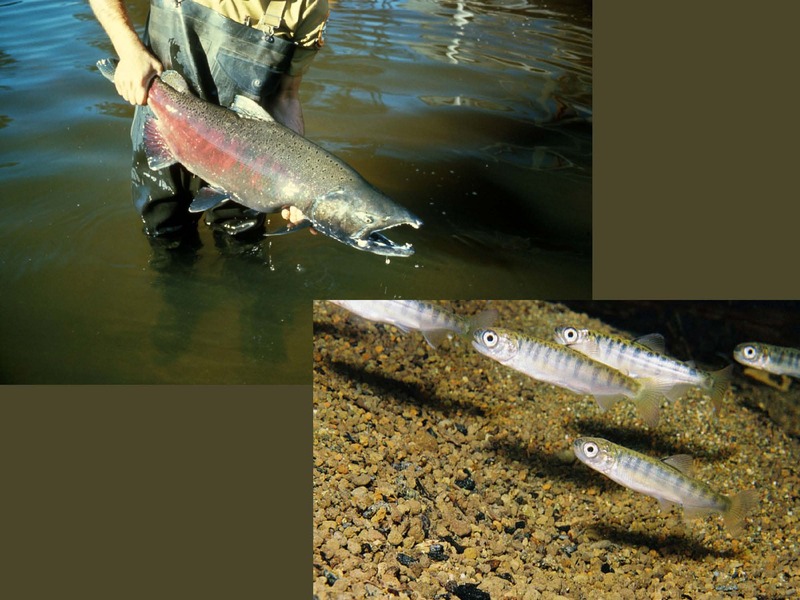 Not long after the Clean Water Act came the Endangered Species Act, which required federal agencies such as Reclamation to consult with the federal fisheries agencies, the National Marine Fisheries Service for anadromous fish like salmon, and the Fish and Wildlife Service with jurisdiction over the Delta smelt and others. 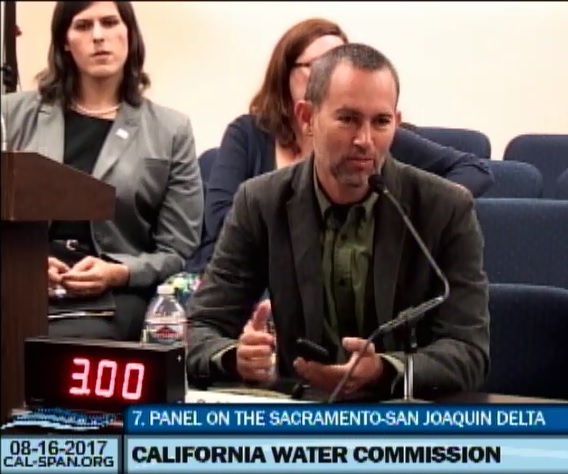 At this point, the panelists were joined by Carl Wilcox, Delta Policy Advisor for the California Department of Fish and Wildlife and Jennifer LaBay, Environmental Scientist with the State Water Resources Control Board. 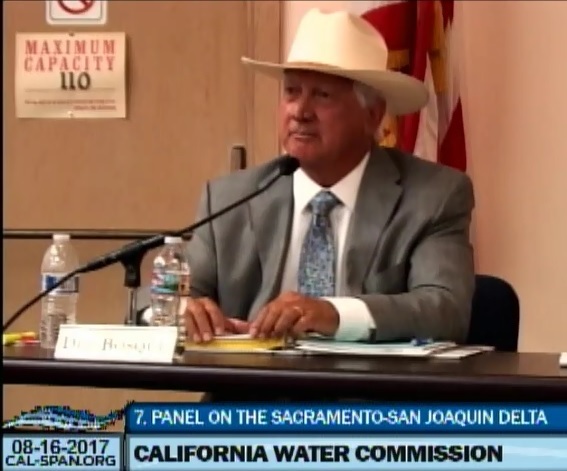 Chair Armando Quintero began by noting that the Delta is 700,000 acres of mostly agricultural land spread out over five counties. It is home to about 500,000 people, most of those in urban areas, although there is also a smaller rural population living throughout the Delta as well. 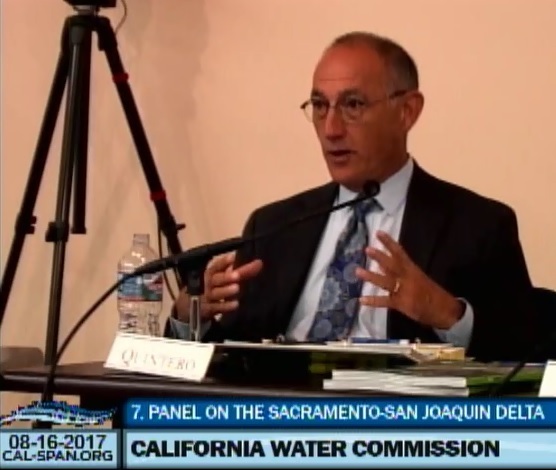 Commissioner Joe Del Bosque asked about the biological changes in the Delta in the last 150 years. Commissioner Del Bosque asks if there are efforts to prevent further invasive species. A panelist (can’t tell whom) notes that the State Lands Commission is working on that; Jessica Pearson notes that the Delta Science Program is facilitating a study on ballast water, a source of introduction of invasive species. Commissioner Joe Del Bosque asks Hap Dunning what constitutes beneficial use and what is non beneficial use? 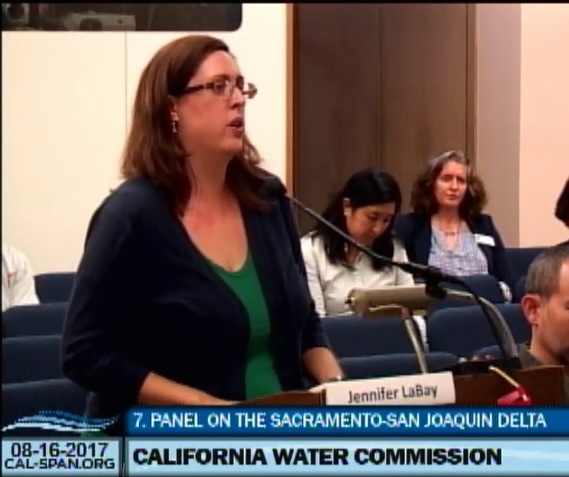 “That’s a big part of the thrust of the Delta Plan’s amendment on conveyance, storage and operations which is to start treating drought periods as part of the new normal and to integrate it better into planning for operations of the system,” added Jessica Pearson. 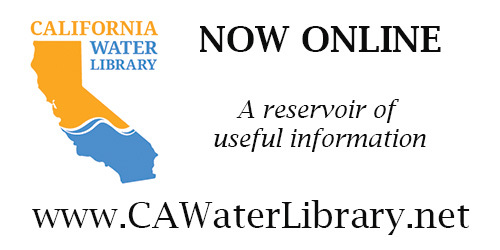 For the agenda, meeting materials, and webcast for the August meeting of the California Water Commission, click here. For the journal article, Water Wasted to Sea, click here. 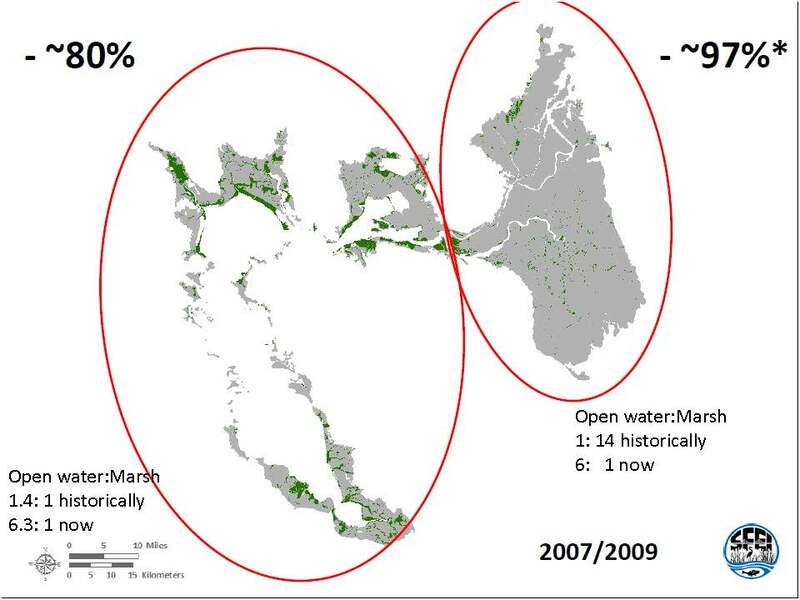 For the Bay Institute report, The Freshwater Starved Estuary, click here.